The Hornsea Project offshore wind farms are likely to be a significant feather in the cap of both Siemens Gamesa Renewable Energy and developer Ørsted (formerly DONG Energy). All the way back in August of 2015, DONG Energy acquired the rights to develop the Hornsea Offshore Wind Zone, a block of offshore real estate located off the east coast of England which, at the time, had the potential of capacity up to 3 gigawatts (GW). Since then DONG Energy, now Ørsted has begun construction work on the 1.2 GW Hornsea Project One earlier this year, which will use Siemens Gamesa wind turbines. Announced this week, Ørsted has similarly awarded Siemens Gamesa with the contract to supply the wind turbines for the 1,386 megawatt (MW) Hornsea Project Two. Both Hornsea Project One and now Two represent Siemens Gamesa’s largest ever wind turbine orders (in sequence). When you combine Projects One and Two together, you already reach a capacity of 2,586 MW. 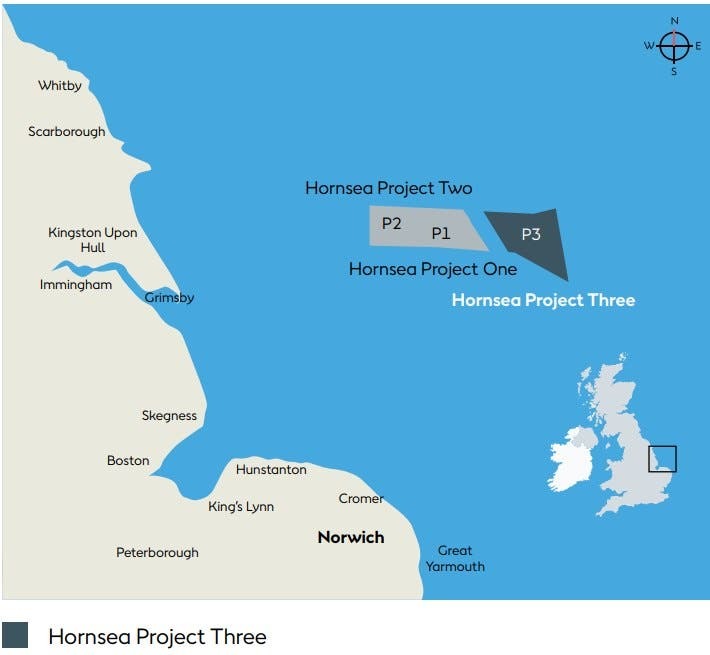 As of the most recent update from Ørsted published in February, Hornsea Project Three could have a capacity of up to 2,400 MW, which if fulfilled would result in an increase of 66% on the original estimates for the Hornsea Offshore Wind Zone back in 2015. This is due primarily to the astonishing cost decreases in offshore wind technology coupled with the development of wind turbines capable of ever greater generation. At this point, it is also reasonable to assume that Siemens Gamesa will successfully acquire the rights to supply wind turbines to the Hornsea Project Three — although that is some time in the future, as Project Three is currently in early project development. In the interim, however, Hornsea Project One continues construction and Project Two has now secured its supply of wind turbines. Siemens Gamesa will provide around 170 of its SG 8.0-167 DD turbines to the Hornsea Project Two, located 89 km off the east coast of England. The turbine nacelles will be produced at the company’s new factory in Cuxhaven, Germany, while the majority of the turbine blades will be manufactured at their factory in Hull, UK. Upon completion, the Hornsea Project Two will be able to generate enough electricity to provide the equivalent needs of 1.3 million homes — a single 8 MW wind turbine being able to supply 8,000 homes.